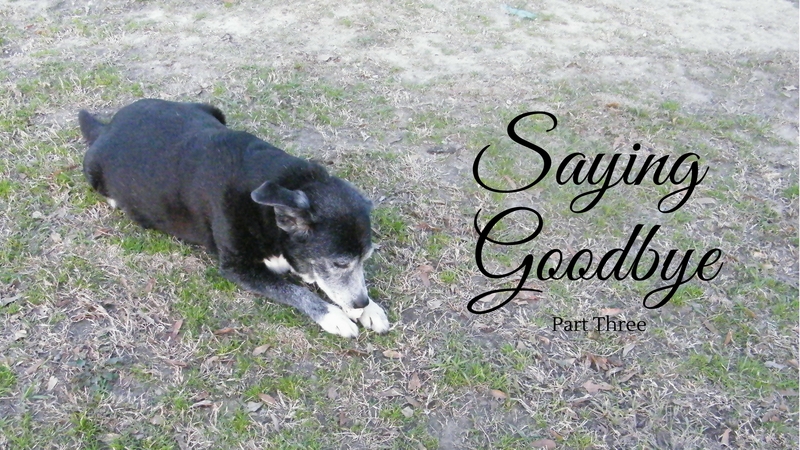 This is the last post in a three part series about our dog Trinity, who passed away last weekend. If you missed Part One, you can find it here. You can find Part Two here. Even though Trinity really enjoyed living out in the country, I had an economic decision to make. It was just after Hurricanes Katrina and Rita. Gas prices had skyrocketed. Driving back and forth to town every day for class and work became more expensive than the rent I was paying for my room in the house. So, I decided to move back to town. It was back to apartment life for the two of us. Trinity adjusted fairly well. She enjoyed all the walks she got again, though she would have preferred them without the leash. I had graduated from college, then went to work for a lab in my former department. It was there I met my husband, Andrew. Andrew met Trinity on our first date. He was a little surprised…Trinity was a Border Collie mix. He had a Border Collie of his own. Trinity liked Andrew a lot. He would bring his dog Blaze over, or I would take Trinity to his apartment, and we would all walk to the closest park. Andrew and I would fish, and the dogs would gaze longingly at the ducks. They would occasionally hop in the pond for a quick swim (and a quick duck chase). Andrew was also a runner, and he would occasionally take Trinity with him on a run. We went camping, and canoeing, and played frisbee. It was during this time that I started working for a veterinary diagnostic lab at our university. While I was working at this lab, I was able to do a lot of testing for Trinity for free. As a result, we found out that Trinity had a simple deficiency. With vitamin B12 supplementation, her digestive problems that she had dealt with since her poisoning simply went away. She didn’t even have to have special food anymore. Andrew and I eventually decided to get married. We became one big, happy family. Soon, we were expecting our first child. We moved into a small house in town. When we brought Bear home from the hospital, Trinity and Blaze were so excited. They had something new to take care of! As Bear grew, and learned to walk, Trinity had to find a few hiding places. But she was always gentle with Bear…even when Bear wasn’t so gentle with her! We soon moved to our little farm. Trinity was finally able to return to the farm life, she had enjoyed so much in her younger years, but she was much older this time. Chase was no longer her game of choice. She now preferred to wander around, smelling all the fantastic smells that farm life had to offer. We had three more children. Trinity was amazingly gentle with them all. She enjoyed her life in retirement. Blaze died a few years after we moved out here. He had always helped Andrew with the cattle. After a rather unfortunate and scary incident with the cattle, Andrew and I agreed that he needed a new cow dog…Trinity had absolutely no interest in playing with the cows. She was in retirement, after all! Along came Midnight and Sandy. Then a year or so later, when neither of them was very good with the cattle either, along came Patch. Trinity eventually learned to accept each new addition…well, when they got bigger than she was, anyway! Sandy continued to let Trinity boss her around, and Trinity took that responsibility very seriously. Trinity’s experiences with mange that I wrote about in this post would soon come to an end. After the first snake bite, Trinity took to snake hunting. Fortunately, she was only bitten once more a few years later. Though we thought she wasn’t going to make it again, she miraculously pulled through one more time. About three months ago, she started getting sick for the last time. It started with a persistent cough. Sadly, there was a tumor growing larger and larger. It was finally inescapable. The dog who had cheated death so many times was finally dying. We are grateful, in a way, that she was really only seriously uncomfortable for about a day. We didn’t have to make any decision about putting her down. She died during the night, peacefully and on her own terms. She always did do things on her own terms! Trinity knew a lot of people in her long doggie life. She was a legend. In the end, she was loved by her family…by four small children and their two parents. Her antics will be remembered for years to come. Perhaps, then, she’ll never die after all. One thing is for certain, Trinity will be missed.